Christmas is the best time to make and give gifts. 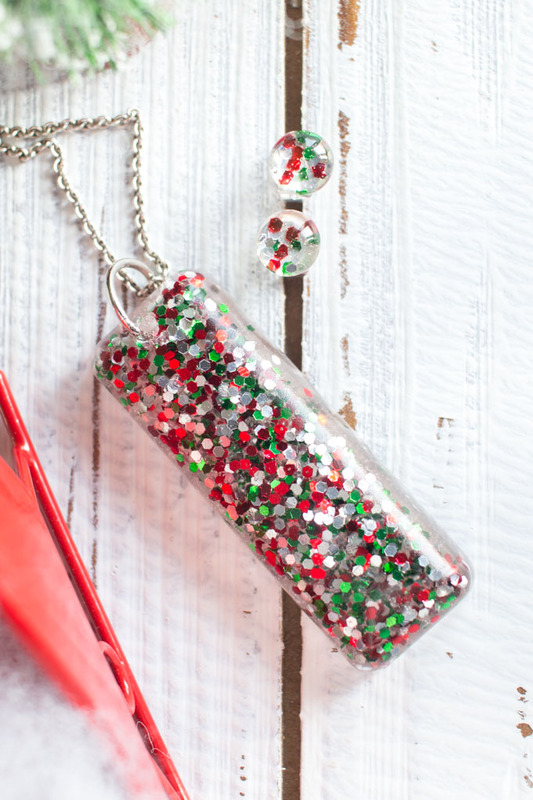 With six girly-girl nieces and three daughters, I find jewelry is always great gift option for the holidays. 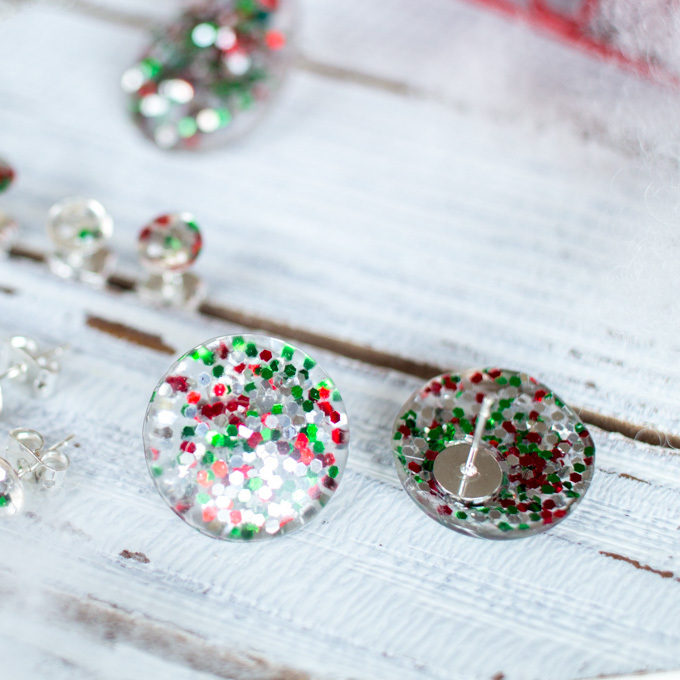 These DIY resin stud earrings and pendants were easy to make and are the perfect festive touch for Christmas. Hi there! This is Jane from Sustain My Craft Habit, a DIY, crafts and home decor blog where my sister Sonja and I share new nature-inspired ideas each week. 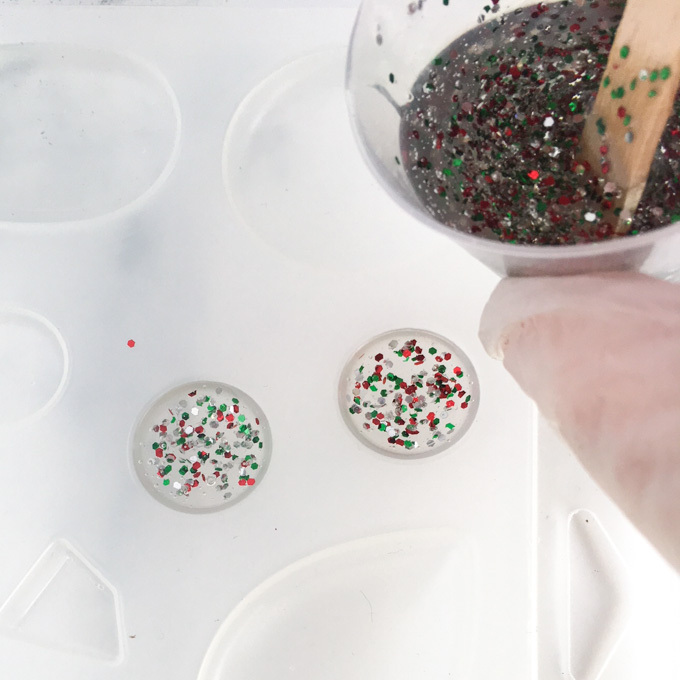 I recently saw these Kate Spade glitter stud earrings and I just had to try and DIY them! 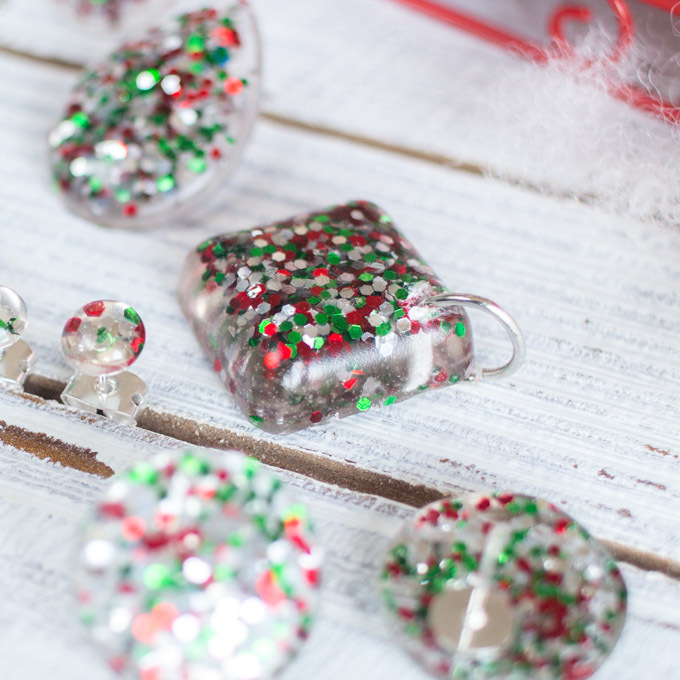 I put a Christmas spin on them using Envirotex jewelry resin. 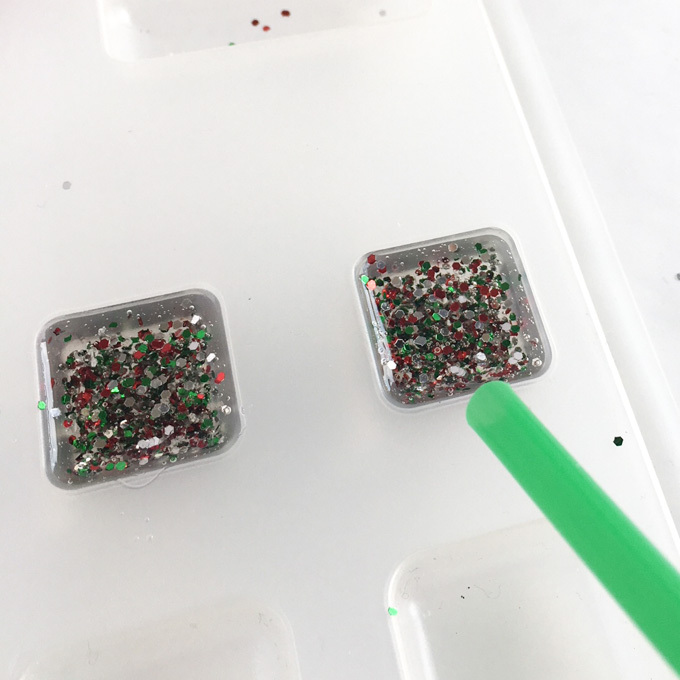 For my Christmas crafting this year I bought some red, green and silver glitter. 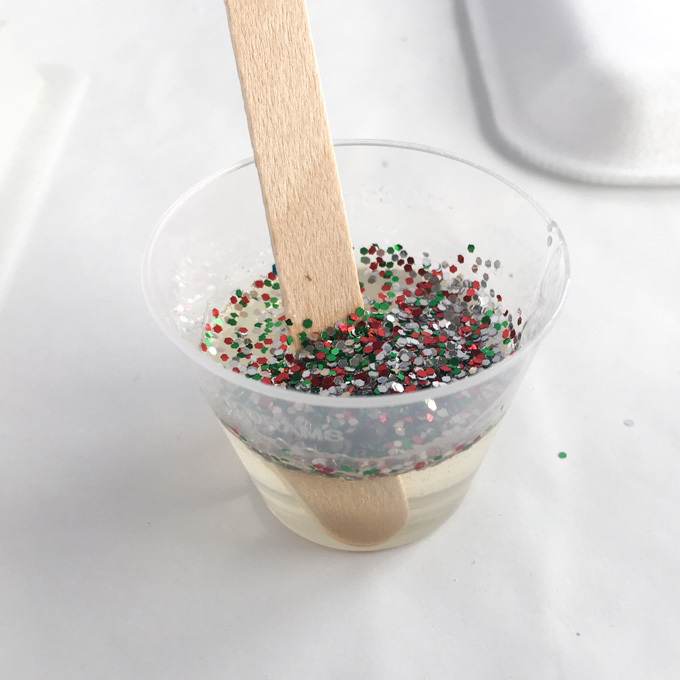 Glitter is not typically a medium we use a lot of, especially in these bright colors. If you stop by our blog you’ll find lots of beachy coastal colors such as teals, whites and taupes. So it’s fun to venture outside of our usual color palette and get bright, cheery and festive for the holidays. 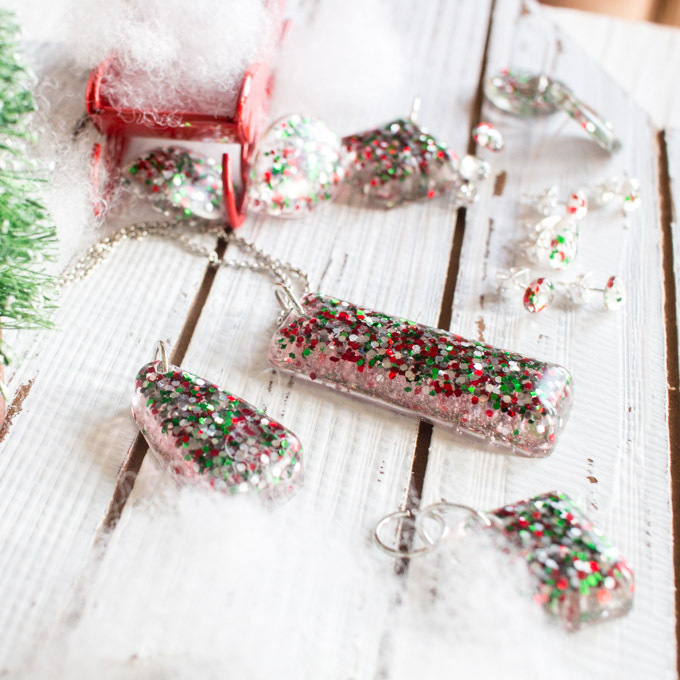 I recently used the silver glitter to make these kids’ school photo ornament gifts as well as to make some candy cane luminaries from Mason jars. The simple earrings and pendant were about as easy to make as it gets with the jewelry resin. 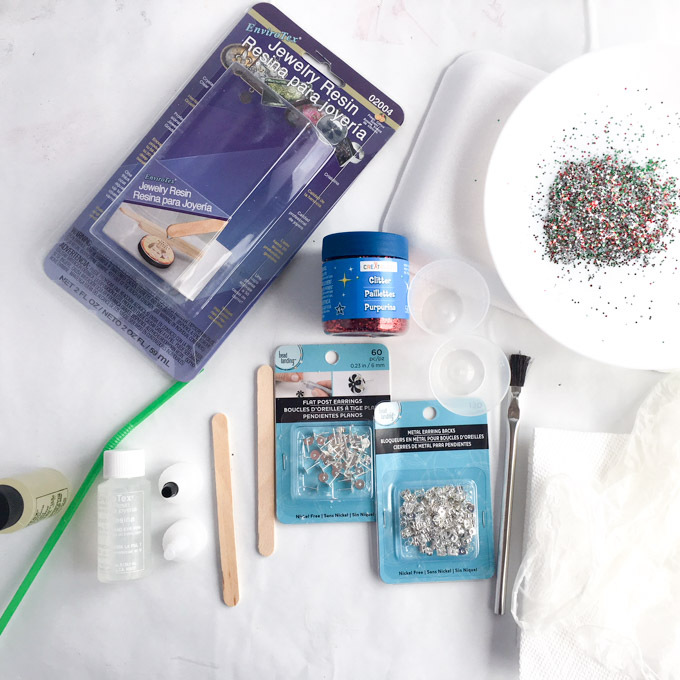 I just picked up a few basic jewelry making supplies at my local craft store and got started. I ended up experimenting and making this jewelry using a couple of different techniques. 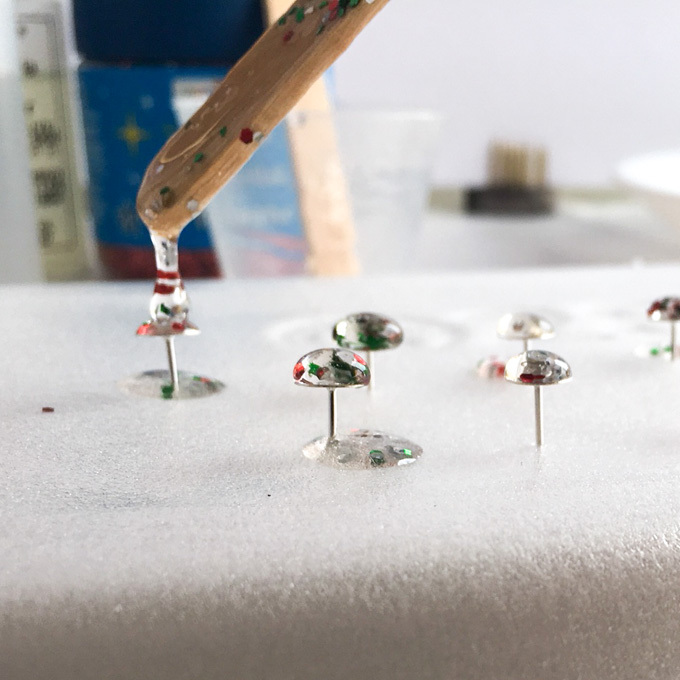 For the small stud earrings, I simply placed droplets of the resin mixture directly on the earring backings. I used jewelry molds for the larger earrings and the pendants. Work in the well ventilated area and be sure to read all the instructions on the products before beginning your project. To make the small earrings studs directly on the earring posts, poke the flat posts into a piece of Styrofoam, cardboard or other firm foam to keep them level as possible. Apply a mold release / conditioner to the jewelry molds as per the instructions in the package. Mix exactly equal amounts of Resin and Hardener into one measuring cup. I used very little of each, only about 10 mm and it went along way as you’ll see. Pour the mixture into a second cup and stir for an additional minute, scraping the sides of the container with a clean stir stick. Once combined mix in a generous amount of glitter. 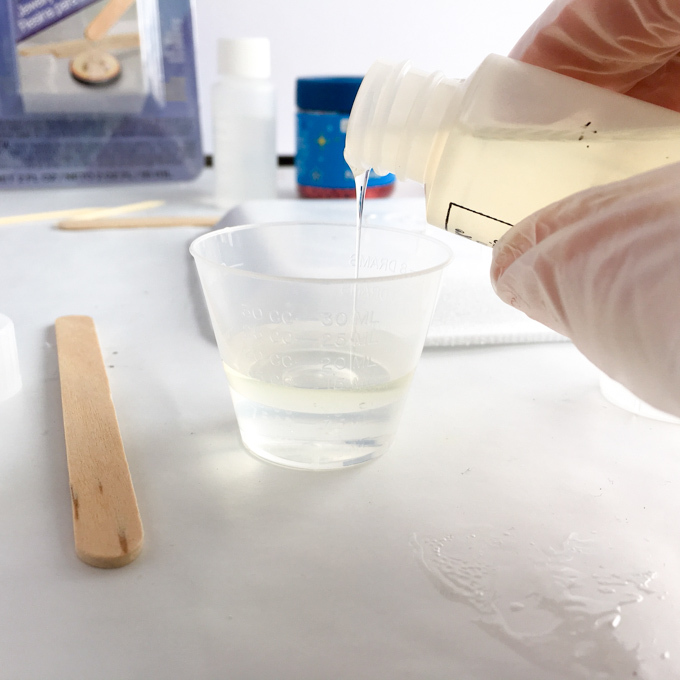 Using the stir stick drop small amounts of the resin mixture onto the flat surface of the earring posts. Try to get a nice domed droplet without the resin pouring over the edges (but not to worry if it does). Fill your desired jewelry molds as well. 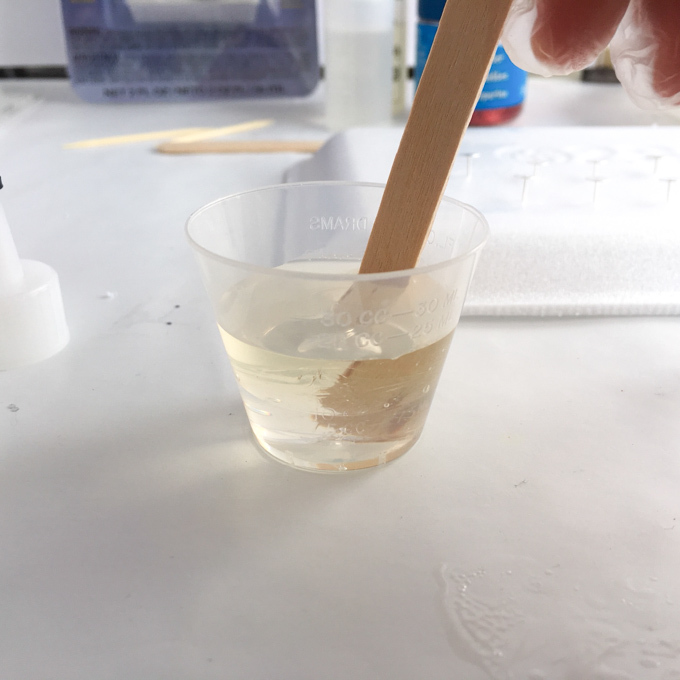 Finally, gently blow off any air bubbles that have risen to the surface of the resin (you may need to repeat this a couple of times during the initial curing process). Cover the pieces to keep dust out and let them cure overnight (24 hours for a soft cure and up to 72 hours for fully cured jewelry). 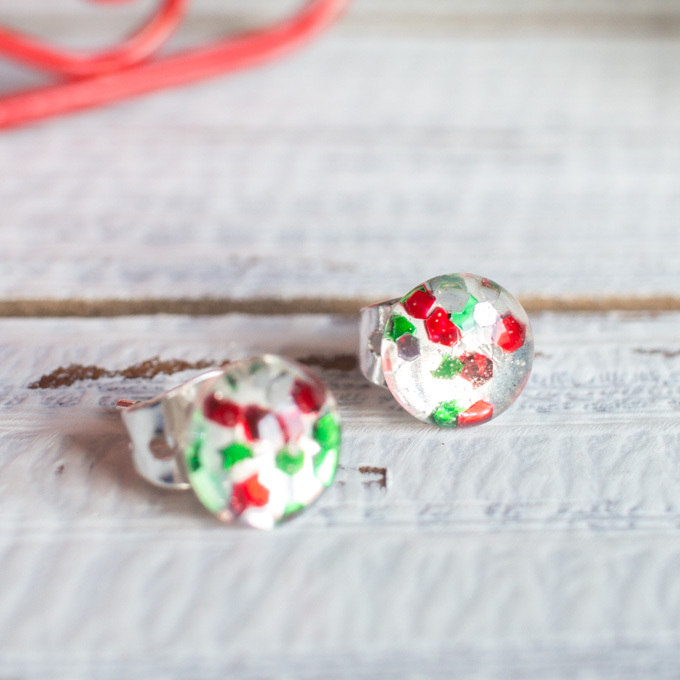 The DIY resin stud earrings should be good to go! For the other pieces, carefully remove them from the mold. With a sharp utility knife trimmed around any of the sharp edges on the back of the pieces. 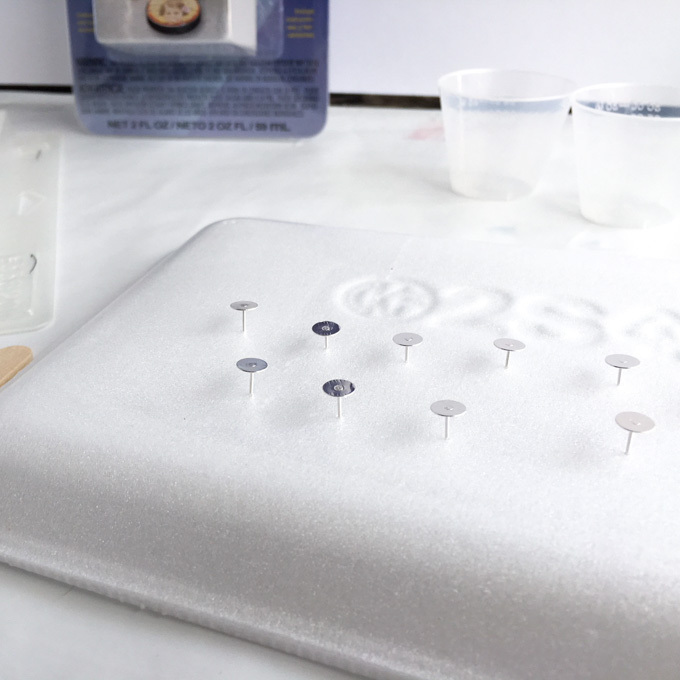 If needed, glue the earring posts onto the backside of the jewelry pieces using E6000 jewelry and bead glue. For the pendants, drill a small hole into the top of the resin through which you can insert a round jump ring. I love how these pieces turned out. With very little resin I now have beautiful, handmade holiday gifts for all my nieces and daughters. 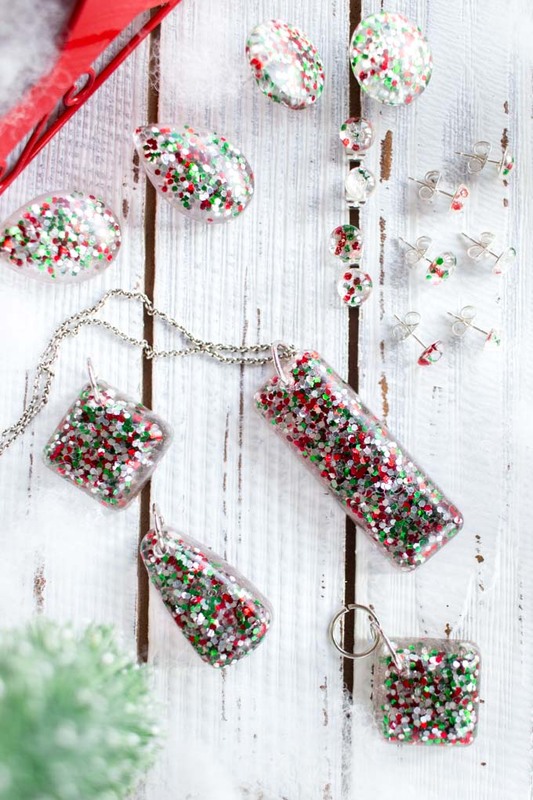 These would also make lovely gifts for co-workers, your boss or a special friend. 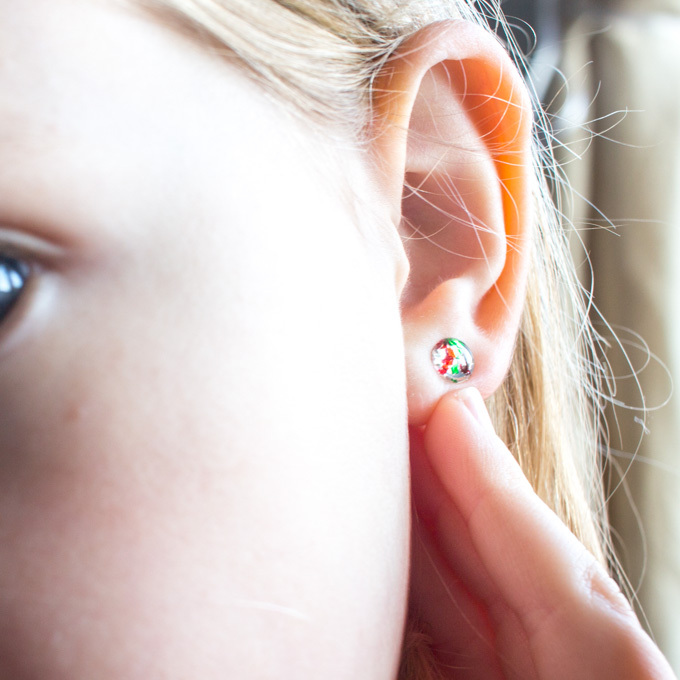 My six-year-old saw me in process and couldn’t wait to get her DIY resin stud earrings; here she is modeling them. And she was so excited to tell everybody that her mom made these earrings for her. 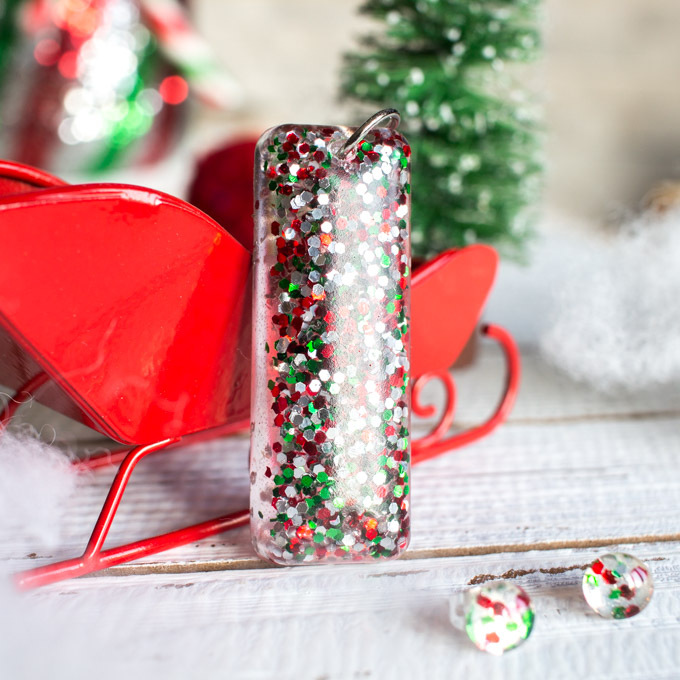 How is your Christmas gift making coming along?